EU20-25, location unknown. My data give ‘March 1959’, but the locomotive still bears the old designation E05-25. Photo from my collection. EU20-17, date and location unknown. Source: as above. EU20-24 at the Railway Museum in Warsaw. Photo taken on September 5, 2006. Derelict EU20-08, photographed in Piotrków Trybunalski on August 16, 1983. Photo by Krzysztof Słowikowski (from my collection). 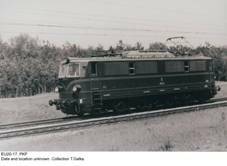 In early 1950s PKP had only eighteen electric locomotives suitable for regular line traffic: two EP01s (pre-war machines of British origin), eight EP02s (modernized variant of the former, assembled in Poland by Pafawag) and eight EP03s (built in Sweden by ASEA in 1951 and 1952). Based on technologies dating from the 1930s, they had little potential for further development, if any. 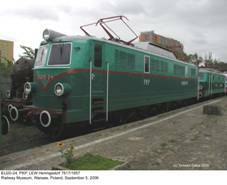 Polish locomotive industry was not yet ready to undertake design and manufacture of electric locomotives; indigenous ET21, based to a certain extent on Soviet VL22M, appeared in the prototype form only in 1957. It had been decided, however, that electrification would be proceeded with, and supplies from Eastern Block countries were, for obvious reasons, initially considered the only acceptable solution. In early 1950s negotiations were started with VEB Lokomotivbau – Elektrotechnische Werke ‘Hans Beimler’ of Hennigsdorf, Eastern Germany (known as LEW and located at the former Borsig plant, later a division of ADTranz and finally of Bombardier). Orders were finally placed in 1953 and included, apart from thirty-seven EMUs (35 class EN56 for suburban traffic and two class ED70 for long-distance traffic), also universal electric locomotives: 25 four-axle and 34 six-axle ones. 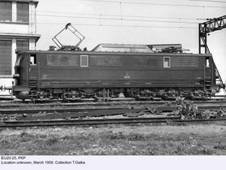 The former, initially classed E04 and after 1958 re-classed EU04, were used mainly with passenger trains, and the latter were intended principally for heavy freight traffic. Delivered between 1955 and 1958, they were classed E05 and later re-classed EU20. EU20 was, of course, much heavier than EU04, but due to the Co’Co’ layout axle load was in fact slightly reduced. These two locomotive types shared the same traction engine type and many other sub-assemblies, including e.g. air compressors and current converters. At the time of their introduction, EU04 and EU20 were the most modern electric locomotive types in PKP service. Both were basically considered universal machines, but EU20s were assigned mainly to heavy freight traffic between Warsaw and Upper Silesia (this line was electrified in 1957) and only sporadically hauled passenger trains. At almost the same overall weight as early production ET21s, their continuous rating was higher by over 20%. Their design maximum speed was 110 km/h, but running qualities at higher speeds left much to be desired. 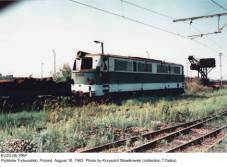 Initially they were based at the Piotrków Trybunalski depot and stayed there for most of their service life. Just as with EU04s, there were problems with poor reliability. In particular, failures of cast-iron startup resistors were commonplace, due to inadequate cooling. Availability rates were comparatively low, at least initially, and withdrawals started quite early; first EU20 was written off in 1976 and the last one followed five years later. EU20-24 (LEW 7817/1957) has been preserved at the Railway Museum in Warsaw. This locomotive is on static display and sports an early livery variant, with two shades of green separated by a narrow red strip running along the body and V-shaped at front and rear walls. - LEW factory lists by Jens Merte.